Standard issue for many medic and survival kits, these shears are so strong that they can cut a penny in half. Constructed from stainless steel with ABS handles. Measures 7 1/4 in. overall. Set of two shears. Just a great shears and we get two. Double the greatness. I have used in just about every place I can think of both in and outside of the house! I have cut rope, aluminum, copper, twine, and tarps to name a few. They fit comfortably in my hand...easy to use...and clean up easily. Really impressed with them! I bought ten pairs and am down to two. It's not because they wore out either. They make great gifts, for camping, first aid, trimming meat, cutting sewing material, the list is endless. 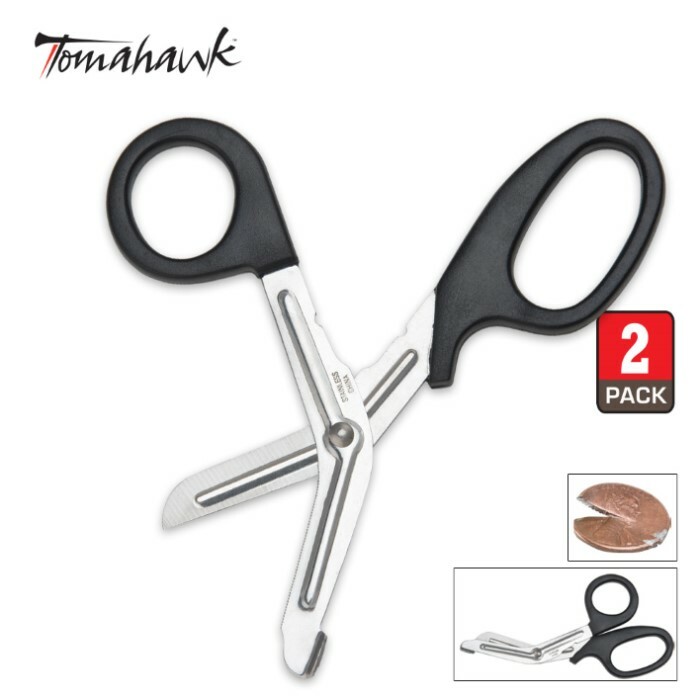 Just got my second set .These are very nice scissors very strong was cutting tin with mine stayed sharp no chips liter and easer to use then Tin Snips . Got a set for my B O B and another set for my First Aid Kit .100% satisfied a great deal !! Tested them on old jeans and canvas, cut right trough them. I have two medical bags and stock them in both with two in reserve. Excellent for the price, but only fair as far as shears. Larger than expected. Not for cutting casts, but 1/4" rope is little match for these shears. I bought these for crafts. I also cut a penny in half when I got them! I use mine to cut Popsicle sticks; after a lot of use they are a tiny bit loose but still work the same. And that's just one out of two...I gave the other pair to my mother. I would definitely recommend these. You can believe I cut a penny in half with these the same day I got them. It's by no means effortless, you definitely have to work it, and word of warning; if you do decide to cut a penny in half, it might cause the blades to part slightly from one another, which may make it less suitable for very thin objects like paper.